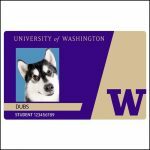 UW students and employees now can include their preferred name on their Husky Card, which is being redesigned with a new look. Free card exchanges are available from Apr. 2 through Jun. 1 for preferred name changes. After this, the standard $25 replacement fee for a Husky Card will apply. Learn more.